Pianist Paul Bley, one of the most consistently creative improvisers in the history of modern jazz, and a major influence on music at ECM, has died, aged 83. His artistic journey, spanning seven decades, engaged with almost all of the music’s stylistic upheavals and transitions, with Paul characteristically ahead of each wave. He formed his first band at 13, and at 17 founded the Montreal Jazz Workshop. At 20 he played with Charlie Parker, and his first album as a leader, Introducing Paul Bley, had Charles Mingus and Art Blakey as rhythm section. Paul encouraged Carla Bley to compose for the Giuffre group and to provide repertoire for his own trio on epochal albums including Footloose, with Swallow and Pete LaRoca. By the end of the 1960s, Annette Peacock had become the Bley trio’s composer-in-residence as the music became slower and more abstract. Annette’s music was featured on Paul Bley with Gary Peacock, the first of Paul’s ECM discs, and the subsequent Ballads, while the classic Open, To Love (1972) presented Paul as a solo pianist of great imagination and creativity, performing music by both Carla and Annette. It was his first completely solo recording. In the mid-1980s, at the instigation of Manfred Eicher, Bley came together with John Surman, Bill Frisell and Paul Motian to record Fragments, a production project which quickly turned into a road band. After extensive touring, the same line-up recorded The Paul Bley Quartet in 1987 and there were further collaborations with John Surman – and Gary Peacock and Tony Oxley – on Adventure Playground and In The Evenings Out There. In the following decade the old Bley trio with Gary Peacock and Paul Motian reunited to play on Not Two, Not One, and a free improvised session with Evan Parker and Barre Phillips on Time Will Tell led to the formation of another band, documented live on Sankt Gerold, recorded at the Austrian mountain monastery of the same name. Paul’s last albums for the label were solo recordings, made in quite different contexts. Solo In Mondsee found him at the Bosendorfer Imperial used for many a classical recital, while Play Blue was a memo from the Oslo Jazz Festival, concluding with Bley’s kaleidoscopic deconstruction of “Pent-Up House”, which Paul had previously played with its author, Sonny Rollins, back in the 1960s. 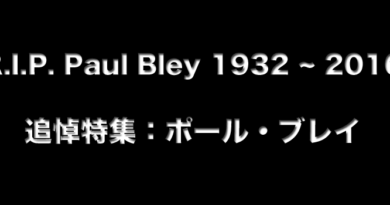 “As time moves forward,” the ever-exploratory Bley acknowledged, “the albums become more autobiographical”.